Conveniently packaged building products for the trade and home improvement markets for projects both large and small. 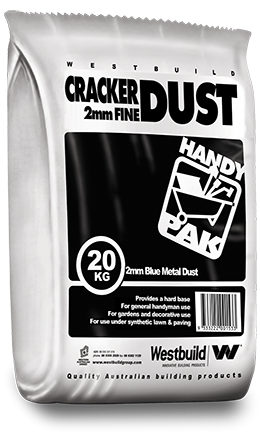 Our range of Handy-Pak products provide the ideal solution for all building basics including concrete and mortar, WA building sands, aggregates and asphalt repair products. Available in 20kg, UV stabilised polyethylene bags. A ready to use concrete suitable for small and structural jobs. 20kg bag - 60 bags per pallet (1.2t) UV stabilised polyethylene bag. 30kg bag - 40 bags per pallet (1.2t) UV stabilised polyethylene bag. Ideal for laying bricks or blocks for retaining, garden walls and general repair jobs around the building site, home or garden. 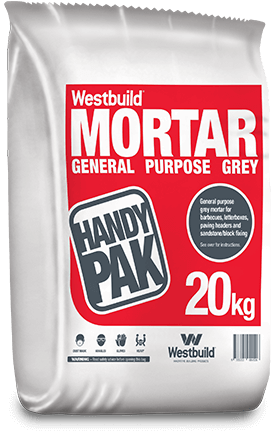 General purpose pre blended grey mortar suitable for brick and block work. Now available in our new, environmentally friendly, significantly stronger, rainproof, polyethylene (PE) packaging. 20kg bag - 64 bags per pallet (1.28t) UV stabilised polyethylene bag. General purpose white washed sand. Ideal for mixing with cement and lime to form a render, best for brick or block work.